The Milkman Half Pint was designed to be the most versatile low-power amplifier possible. Reverb and tremolo and Class A, single-ended breakup are just the start of what this little amp can do. With the onboard voltage-controlled power scaling, you can turn this amp up to 10 and dial it back to just a fraction of a watt so that your fun zone is volume appropriate for just about anywhere. This amp is comfortable on stage, in studio and at home. Because of the variable power, you can set it how you like and adjust the power level for the room. The power section of this amplifier consists of a single 6V6 power tube biased to class A. 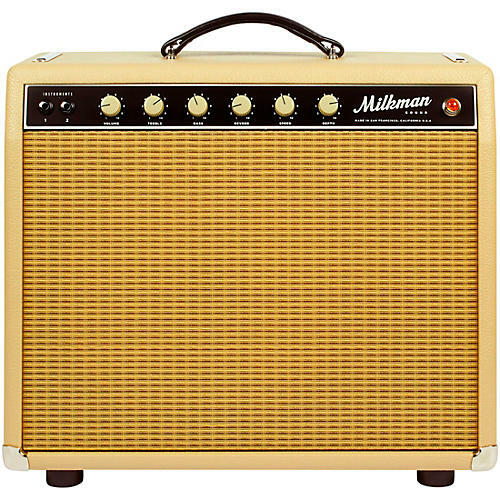 The front end is similar to the Milkman Creamer, with extended headroom reverb and tremolo. The amplifier is hand-wired onto a turret board with Mercury Magnetics and Jupiter capacitors are standard equipment.